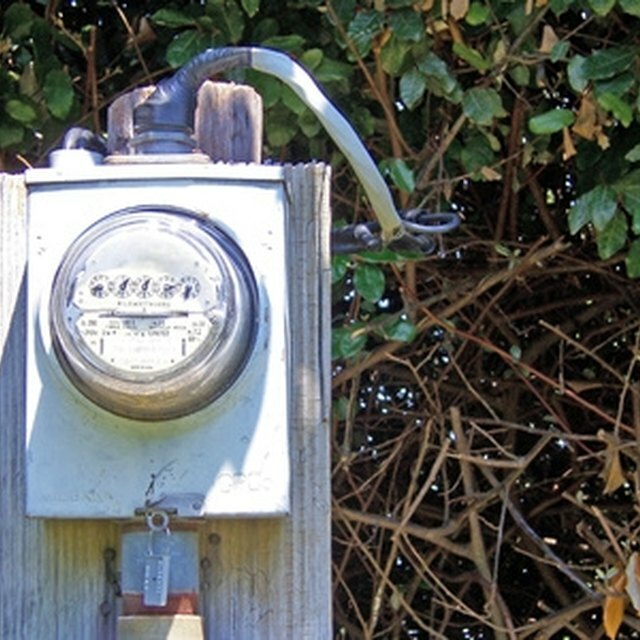 Electric meters are used to record the amount of electrical energy used in any given time period. Typically, a power utility will record this usage once a month. The previous month's reading is used as a base or the amount to subtract from the current reading. You can generally find the last reading on your current monthly bill, recorded in KWH (kilowatt hour). Kilo means 1000, watt is the product of volts times amperage, and hour is one hour of time. Taking all of this into account, 1 KWH is equal to using 1000 watts of electrical power in one hour. An example of this would be having 10 light bulbs of 100 watts each turned on for one hour. Newer digital display KWH meters flash the usage on an LCD display at the current rate of usage. Mechanical numerical displays are easy to read, too, as the numbers are predominant on the meter. The older dial faces can still be a bit confusing to read, but with a little work, you can figure out the amount of power used. Look at the face of the meter. You'll probably see four or five dials. These clock faces will be numbered in both counter-clockwise and clockwise directions. Read the clocks in a right-to-left order or in the direction of the arrow just above or below the faces of the small clocks. Record the lowest number on each clock face. In other words, if the dial resides between a 5 and 6, record the number 5. Reduce a dial number by 1 if that dial is on a solid number and the clock directly to the right is between 9 and 0. As an example, if a dial is on a number 7 and the clock directly to the right is between 9 and 0, subtract a 1 from the 7 for a reading of 6. Keep the number 7 if the same clock dial to the right is between 0 and 1. Subtract the previous month's KWH reading (found on your electric bill) from this current reading. This will give you the amount of power consumed for the current billing period. Look and see if there is a multiplier on the face of the meter. It will be notated as "X2," or some other number with an "X" in front of it. It will also be listed on your monthly statement if it is used at all. Multiply the subtracted reading by this number to find the actual KWH usage. Use the meter readings to track the amount of power used for any given period. This can be helpful in creating an energy-savings program to reduce the overall cost of utilities. Which Way to Turn a Master Lock Combination Lock? What Do the Numbers Mean on Stainless Flatware?